The below are a few of the most popular ''Tunes'' that are played at sessions. The vast majority are worked out for a whistle in the key of D. I will be adding more to this section over time. If you'd like a traditional tune to be placed here then let me know. Contact details are in the ''about me'' section. See the link at the bottom of the page. To play tunes by ear or to read the sheet music ? That's a question I have read on many's an internet forum. Players seem to be split in their opinion. There are those who feel you should never use sheet music for playing any kind of music, never mind traditional Irish tune. Those are the one's who have a natural gift of being able to play by ear and don't seem to grasp that playing notes doesn't come ease to the majority of musicians. So those who say you should only play by ear would exclude anybody who hasn't got that gift ? In that case their would be millions of people around the world who would never get the chance to enjoy playing a musicial instrument. My view is that if sheet music helps then one should use it, that person over time will delevope an ear and will gain an understanding of keys and if a piece of sheet music is put in front of them they'll be able to play it where as if the same sheet was put in front of the person who only plays by ear, , well they may as well be looking at a hedge. I get sent many emails from people who have stated that they recently took up playing the tin whistle, some are aged over 80 years old and said that without the music notes on this site they would not have continued playing the whistle. This is very gratifying to hear and Im delighted to be able to help out. 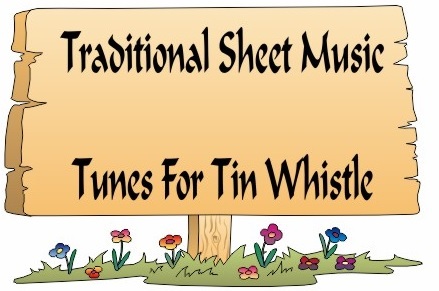 As a way of helping those who struggle to read tin whistle sheet music I have decided to place the ''Letter Notes'' beside each note in the sheets from now on. There are still some old one's that have been on the site for years that can't be changed now. If you want a traditional tune worked out then let me know and I'll see what I can do. So what about the pop music section on the site ? I was very hesitant about setting up this section. I really hadn't a clue if it would be popular or if I was wasting my time. So I took a chance and put a good mixture of old and new songs. It has really taken off and is now as popular as the folk songs. I had been playing some of these songs for years and if I was willing to play popular music on a tin whistle then there had to be many more like me. You see the whistle has always been associated with traditional music and if you said to someone that you played a whistle they automatically assumed you were into trad. They would never think you played anything other that traditional or folk songs. One other reason for setting up the pop section was to make the instrument more mainstream. Learning Traditional Tunes - The advice I gave in the folk songs section about getting these tunes into your head is pretty much the same for trad. tunes. I think learning how to play songs on the whistle is much easier as the melody of the songs will already be in your head from years of listen to ''Dirty Old Town'' for example. My advice on these tunes is to learn one line at a time, it doesn't matter if it takes you all day to get the first line off by heart. The next day get the second line off even if it takes 100 tries. Then put the first and second together and so on. By the end of the week you'll be able to play the tune off by heart. Some people write to me asking if I have any easier versions of a tune as they are finding it too hard to play. When I ask how much long they watch television for compared to learning your tin whistle then the reason they find the tune hard to play becomes apparent. Too much television and not enough practise.